"KEY PLAYS AT KEY TIMES"
St. Paul Central drove its way deep into Minnesota's hoop history book, before thousands of mad fans at the Minneapolis Targ et Center. 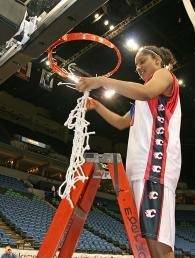 On March 17, 2007, the Lady Minutemen proved beyond a doubt they are the state's best girls high school basketball team EVER! 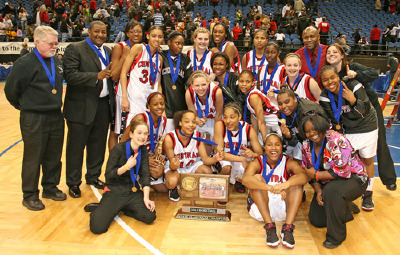 court dominance and convincing 81-63 victory over Minneapolis South earned them the Class 4A state championship title. Dropping look-away passes at will, Central's Point Guard Angel Robinson could not be stopped in the open floor. Robinson finished with 16 points and 6 assists. Robbinson, the Star Tribune's Metro Player of the Year, said, "I didn't think I was going to cry like this." 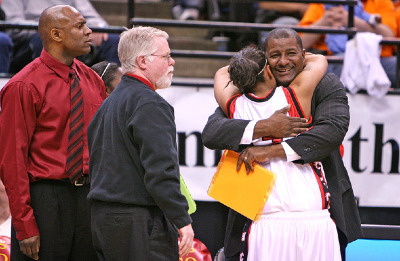 An emotional Angel gave her dad, Central Assistant Coach John Robinson, a one minute hug as she came out of the game and played her last high school game. South's full court press didn't seem to phase Robbinson. Central Head Coach Willie Taylor said, "Angel is very very good. Everybody knows that. What makes her special is she makes those key plays at key times." "Quiet Storm" Kiara Buford (#30) scored 19 points, four assists and two blocks for Central. Buford said "I knew we could do it." Coach Taylor added, "We had a lot of good players and it's tougher than people think. It's been a hard year." 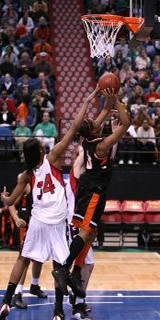 At times, "Difference Maker" Ebony Black (#23) took her opponents off the dribble at will with unlimited moves around the rim. Though not a starter for Central this year, Black went over 2,000 career points and 1,064 career rebounds. 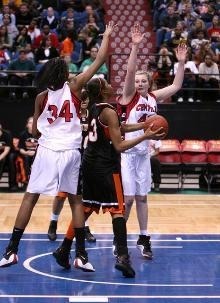 With style, fineness and power, Black scored 18 points and 10 rebounds in the state championship game. Black said "When we play big teams, I know its my role to step up and I know I've got to take over. It's really fun to have a team where everyone can play on your level." 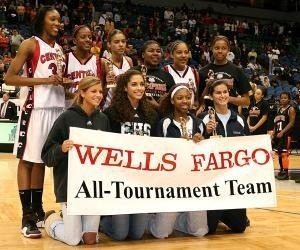 Robbinson, Buford, Georgie Jones and Theairra Taylor were all voted to the All-Tournament team. The Minutemen's Jones aka " Lady Eraser" scored 11 points, 15 rebounds and 5 blocks. Jones controlled the glass all game. Super Sophomore Theairra Taylor finished with 11 points and Megan Howard finished with 4 points. South's three-guard-offense of Tayler Hill, Ephesia Holmes and Tyisha Smith combined for 49 of the Lady Tigers' 63 points. Hill and Homes were also voted to the All-Tournament team as well. 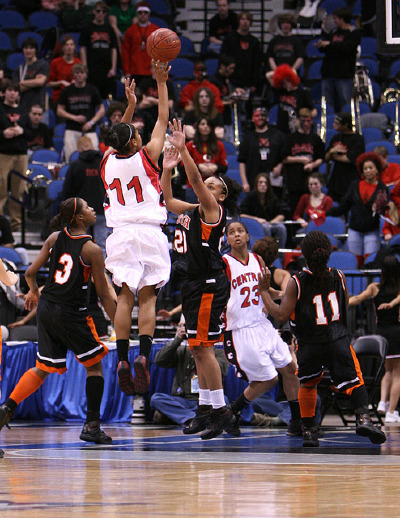 Holmes' kept her team within striking distance with 21 points but she was in foul trouble all game. She picked up her 4th on an offensive foul late in the first half. Minneapolis South Head Coach Ahmil Jihad said, "We just couldn't get it done." Freshman Tyisha Smith finished with 13 points. Three-time All-Metro 1st Team Sophomore Hill, who averages 27 points, was held to just 15 points. Hill said, "We have a really young team. We are excited for next year. We played strong this year and we're happy with our season." 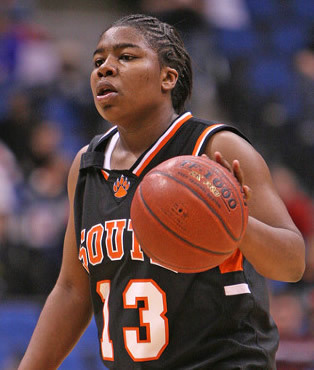 Minneapolis South finished as Minnesota's second best girls high school basketball team. Central's Robinson said, "It's perfect. It's my senior year and I've wanted this for a long time. I finally got it and I'm so happy." P-e-r-f-e-c-t Season! (CLAP... CLAP. clap ! clap ! clap! ). 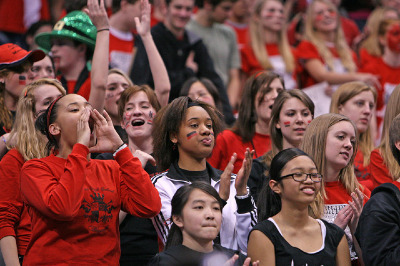 © Copyright 2007-2010, gPrep.net, All Rights Reserved.